My life as a journal keeper began in high school (9th grade). I'd just come home from a Halloween party where a 10th grader (!) played with my large, costumey earrings. Attached to my ears. Swoon. Years of journaling about the ups and downs of Patricks eventually developed away from what was, essentially, a diary about my social life and into writer's notebooks. I keep poems I like by other authors, book recommendations, notes from writing conferences and workshops, things overheard while driving my son's carpool. It's an "everything but the kitchen sink" kind of deal. 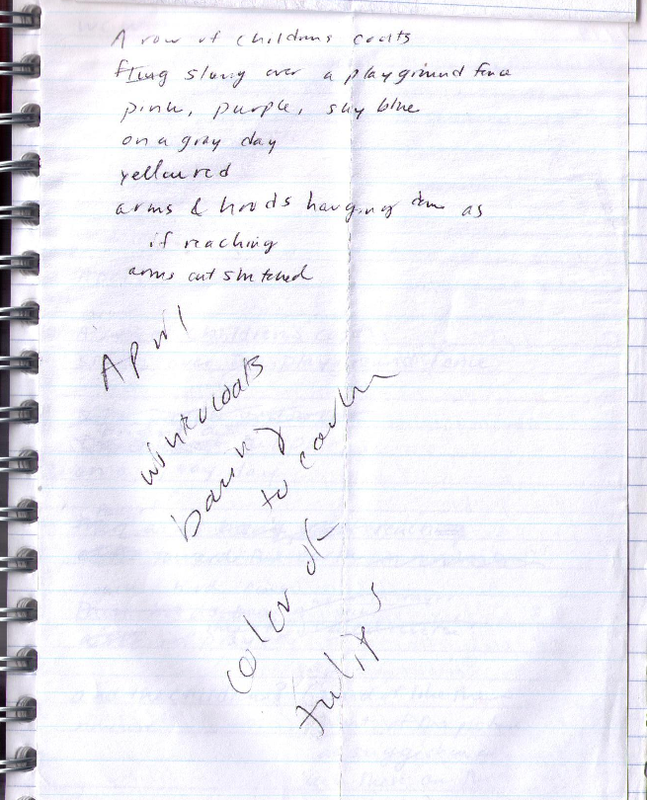 The photos I am sharing show the development of one poem from my chapbook, published in 2010. The poem is entitled "In Early Spring." I was trying to capture something that caught my eye as I was leaving my kids' elementary school in spring -- a bunch of winter coats abandoned on a fence. Until today, I'd forgotten that I had stapled several layers of notes for this poem into my notebook. The next layer of paper in my notebook (below) has two sections. The bottom layer of notes (below) reveals some of my thinking about the direction the poem was taking. I was aiming for a "no ideas but in things" feel. You can see the initials "WCW" for William Carlos Williams at the top of this page. There are a lot of scratch outs here, too. With a note to myself: "kind of like them [the children] out of the picture, a suggestion only bec. these are their coats. slung over the playground fence. Bright as tulips, pairs of empty arms hang down. They reach for earth, asking. Each hood bows -- a line of prayer. 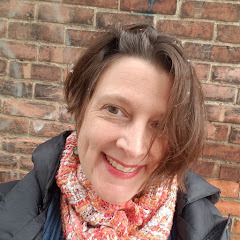 Laura Shovan is editor of LITTLE PATUXENT REVIEW. Her chapbook, MOUNTAIN, LOG, SALT, AND STONE, won the inaugural Harriss Poetry Prize. Her work has been featured at Verse Daily and won an Honorable Mention in the Allen Ginsberg Poetry Awards. She is the editor of LIFE IN ME LIK GRASS ON FIRE: LOVE POEMS (MWA Books), featuring 50 Maryland poets. Laura is a Maryland State Arts Council (MSAC) Artist-in-Residence. Her latest book, VOICES FLY, is an anthology of poetry workshops and student poems co-edited with Virginia Crawford. VOICES FLY will be available this month (April 2012) from MSAC. 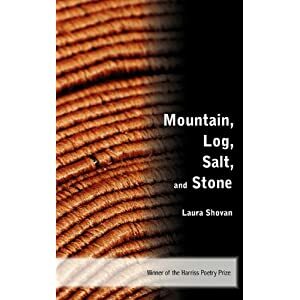 Laura has generously offered a copy of her chapbook, MOUNTAIN, LOG, SALT, AND STONE for a reader of this post. Please leave a comment to be entered into a drawing. Much gratitude to Laura! 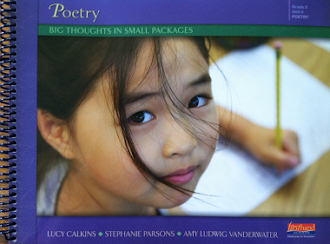 The actual pictures of your process in the poems is terrific to see & to share with students. Some students I've taught have two reasons NOT to do this: they don't like to be messy & are so organized OR they think their first words are good enough, don't enjoy or understand the fun of revising. These examples are just lovely to see in all their scratch-outs & sideways writing, etc. I also love that you were struck by those coats, without one word of saying spring is coming. "hoods bowed in prayer" - a thought to ponder! Thanks Amy & thanks Laura for sharing. Laura, I like your completed poem very much. Especially the line, scattered like the milkweed to come. It extends the poem through 3 seasons. Nicely done. thanks for sharing your process... I like the way you talk about "layering" your notebooks. It's like that - peeling back the layers to find the true words. It's neat to see how this worked with one of your poems... I especially like the image of coats on the fence, sleeves dangling... where are the children? scattered like seeds. I love seeing the evolution of this poem. Shows the value of revision as it makes the poem stronger and stronger. Thanks! Fascinating to see the "birth" of this poem! And the beginning of your journal itself (oh, those earring-touchers!). Laura, I recognize that "car" writing! Don't you love when that happens?! Your result is lovely, and I am thrilled to know about your chapbook, whose title alone speaks to me. Must know what's inside! Wonderful to read all the ways you are living the poetic life. Keep going! What a great post! 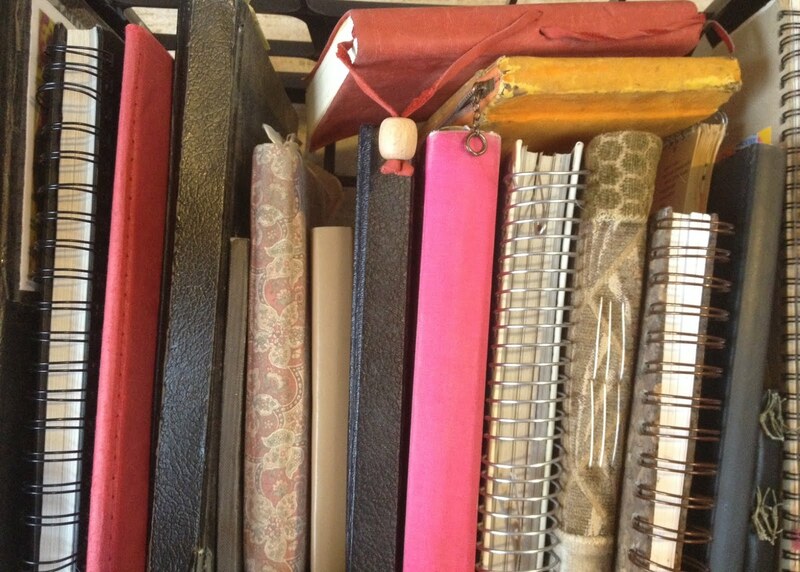 I LOVE peeking in other folks' notebooks and journals. I enjoyed learning about how this poem came to be, Laura, and watching your writing decisions evolve as you worked on it. (I have this wonderful volume so will take myself out of the drawing - but I know whoever wins it will delight in it as much as I have.) Thanks, Amy and Laura. I am such a newbie to the blogosphere. What else have I been missing? I love this poem of Laura's and can't wait to savor more of them. You have a new fan! Thank you to Amy for this notebooks blog. I can see sharing this with students and how this may help them with their own writing, especially those not in a workshop situation. 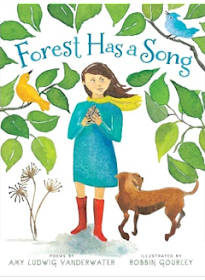 I really find the evolution of this poem so helpful and love the last word, "nowhere" because it makes me think of the freedom some children have to explore and play and be, especially in spring. Just lovely. I am quiety rejoicing, yet wishing a friend was near so I could say, "oh you must hear this", in every second of reading on all these blogs! Many thanks, Janet F.
Such a fascinating peek into Laura's creative process! The finished poem is just lovely. I too am a car writer--an anywhere writer really. 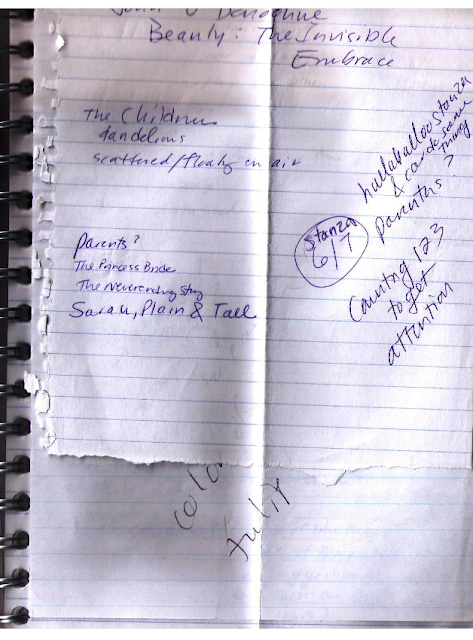 I often jot things down and any blank surface I can find, including the back of my checkbook when it's called for! :)I have tossed many of these scraps of paper as well. I should take a lesson from your art teacher friend Penny, and start saving them. Natalie is the winner of the chapbook! Congratulations! Please send me an e-mail to amy at amylv dot com with your snail mail address, and I will get it off to Laura. Many thanks to all for your words, and much gratitude to Laura for sharing this peek! a. So excited! :) Thank you Laura and Amy for your generosity! Nice. Best part for me was witnessing the evolution of the poem through both handwritten and typed up texts. Thank you Laura! 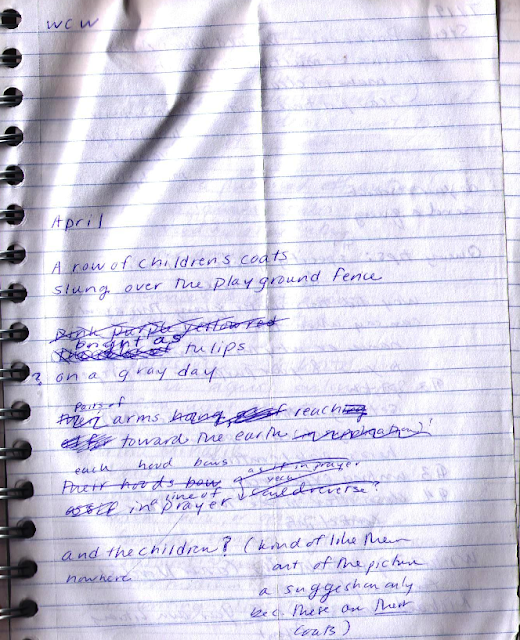 This notebook blog shows both the demystification and mystery of writing.